Have you got a great idea to improve your local community? If so, then Dubbo Regional Council is accepting applications to sponsor your idea under the NSW Government’s My Community Project 2019. 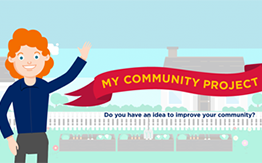 The My Community Project enables individuals to put forward their project ideas and a public vote will decide which projects receive funding in each NSW electorate. However, individual applicants need to partner with a project sponsor (such as a local council or other group) to deliver the project if it is funded. If you wish to seek sponsorship from Council for your project idea then please follow the below sponsorship application requirements. All applications for project sponsorship must be submitted to Council by following the below process by Wednesday 30 April 2019 for assessment. You will be notified by 3 May 2019 as to whether Council will act as a sponsor for your project. Please note the My Community Project online application has two sections – the first section is completed by an individual project applicant and the second section is completed by the project sponsor. It is recommended you contact Council to discuss your idea prior to completing the first section.